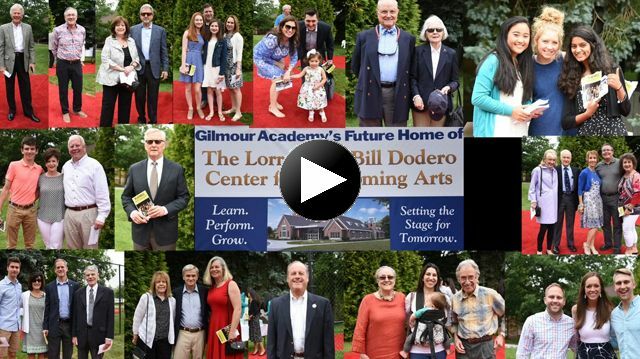 On June 2, Gilmour Academy celebrated a momentous occasion by breaking ground on the long-awaited Lorraine and Bill Dodero Center for Performing Arts. The building will be located in the heart of Gilmour's campus and will be a hub of creative activity with a variety of courses in drama, music and speech and debate. This new dedicated space for the performing arts will provide a scene shop; costume design space; a black box theater that is also constructed for the instruction of dance; and a presentation room for course showcase events for the Catalyst, VECTOR, Robotics and International Studies programs, among others. Speech and Debate will have its own space that includes four dedicated practice rooms so students no longer have to practice in corners, stairwells or hallways. In addition, Gilmour will finally have the space to host tournaments. While the fine arts are a gem on campus, the evidence of students' hard work has been somewhat hidden in the hallways. The Center for Performing Arts will include an art gallery hall where creative works will be on display for the greater community to appreciate. Coinciding with the pouring of the foundation in July and the laying of every brick thereafter, Gilmour will be working on expanding and building a more robust program for what takes place inside. Theater tech classes, dance classes, lighting and sound, one-act plays, theater director and stage management opportunities as well as summer workshops are all on the horizon. Music ensembles, concerts and competitions will also be part of the repertoire. In the fall of 2018, Gilmour will be opening its new after-school music academy in partnership with ArtsConnect and the Cleveland International Piano Competition. This program is open to Gilmour students as well as students from the wider community and is slated to expand with the opening of the Center for Performing Arts. An encore celebration for this programmatic expansion is expected to take place in the early fall of 2019 as Gilmour cuts the ribbon on the building. While the building has met its fundraising goal thanks to the generous and visionary support of hundreds of dedicated donors, Gilmour is still raising funds for program expansion and endowment. Please contact Laurie Bilger, J.D. at (440) 473-8056 or bilgerl@gilmour.org for information on how you can play a part in making this creative dream a reality for our students. We hope to see you in the theater soon! Thanks to all our friends and supporters for helping us reach our goal. Because of you, we can build a better tomorrow.